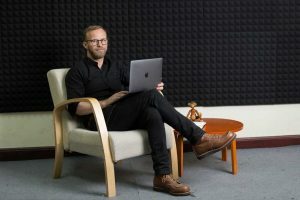 Beginning with a simple Facebook group, Danish entrepreneur Jeppe Carlson, or JP as he is known, set himself on the path to launching the first digital agency in Laos. That Facebook group was So-So Club, an online meeting place for young people that were not lo-so (low society), but not hi-so (high society): just So-So. The group, founded in 2009, functioned like an online community whose aim was to bring together Lao people from all walks of life. Membership swelled rapidly, and JP was soon holding hold events for the group to get together offline, as well as online. “I remember we launched a private So-So party in an abandoned office building. We turned it into a sort of a pop-up nightclub for one night. We even used an old bathroom for the DJ booth,” says JP. And with the venues came sponsors, because So-So group was quickly being noticed. Carlsberg Group began sponsoring the events to help promote their brand, which placed JP firmly on their radar. After a brief foray into POS systems in other parts of Southeast Asia, JP returned to Laos to assess the market. Beerlao reached out to him, asking if there was a way he could help them with their nascent digital marketing campaign. And so, in early 2012, Digital Monkey was born (in JP’s living room). And from there, the list of clients just kept growing and growing, along with the number of Facebook users in Laos. 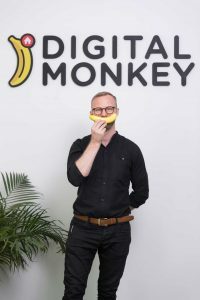 And after JP teamed up with some local partners, a number of big names such as Lao Ford City, Unilever, Beeline, and Express Food Group signed up with Digital Monkey. “Everybody in Laos knew that they had to do something digital. But very few people knew how to do it. We were able to assist them in engaging with their audiences in a way that had never been done before,” says JP. 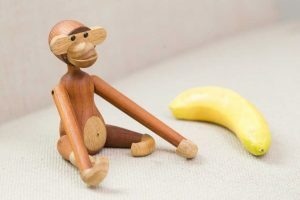 Now days, the Digital Monkey office takes up a whole third floor at the K&C building, and boasts a large troupe of digital primates busily working away on content, video, and managing the social media presence of some of the biggest names in Laos. JP says that the digital world is changing at an ever faster rate. From text to pictures, and now to video, the trick is to catch the wave before it lands, and ensure that your marketing strategy remains resilient and adaptable. But that’s only a one-banana problem for Digital Monkey.